cosybedsandburrows is located in Leeds. It's a family run business which uses my passion for small animal pets, my mum's skills on a sewing machine to turn these into patterns, all combined with my Dad's practical and DIY skills to make things a little different. Using my experience, of having bought literally every small animal bed and accessory on the market, I have developed by own range of small animal pet beds and accessories which your pet will find enriching and cosy, whilst us humans can enjoy high quality and attractive designs. 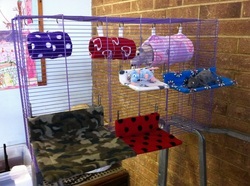 The products can be enjoyed by a whole range of small animals, from mice, gerbils, hamsters and degus, to rats and chinchillas, and also rabbits, guinea pigs, ferrets. I'm really excited to see what you all think of the Cosy Rode-House Tubes which I don't believe there is currently anything out there like, and also my range of Cosy Hammock Hangers in various shapes and sizes, plus I hope you love my fabric choices as much as I have loved finding them. All my products are designed with easy cleaning in mind. All are machine washable (30' delicate cycle recommended) and all extra covers are available in all sizes so you can have 'one in the wash/one in the cage'. Please have a browse around my website, feel free to contact me on e-mail, cosybedsandburrows would love to hear from you.